Sen. Juan "Chuy" Hinojosa, D-McAllen, featured left, has announced that he will be soon be posting key dates on his legislative calendar that will allow his constituents to began shaping legislative priorities in the coming year that will result in bills being filed when the Texas Legislature returns to work in January 2011. "I will be busy working on interim committee assignments and reviewing state agency efficiency reports as a member of the Texas Sunset Commission," said Hinojosa. "We are just over a year away from the start of the 82nd Legislative Session, and already ideas for legislation are starting to trickle in to my office. My offices will be working hard to prepare for another successful session in 2011." He invited constituents to contact him and his staff with any ideas they have regarding proposed legislation or issues facing the state agencies under Sunset Review. Hinojosa and his staff may be reached at 512/463-0120. Hinojosa is featured here during a major gathering of the U.S. 281 Coalition during a Tuesday, December 15 session at the McAllen County Club. Hinojosa and Deirdre Delisi, the chairwoman of the Texas Transportation Commission, were honored by the coalition for their vital work in helping secure $114.5 million during the 2009 legislative session for major improvements along U.S. 281. 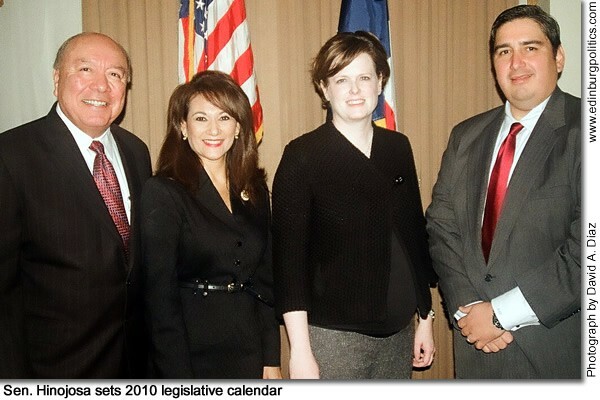 Featured, from left: Sen. Hinojosa; Rep. Verónica Gonzáles, D-McAllen; Texas Transportation Commission Chairwoman Delisi; and Hidalgo County Judge René A. Ramírez. The state representative campaign for Sergio Muñoz, Jr. (featured second from right) on Monday, December 21, drew big names and generous contributions from House District 36 constituents during a fundraiser held that evening at Balli’s Social & Event Center in Mission. Almost 150 supporters, including Mission Mayor Norberto Salinas, Pharr Mayor Mayor Leo "Polo" Palacios, and Hidalgo City Commissioner Guillermo Ramírez, joined Muñoz, a Democrat, and his family during the rally. "Sergio will be the kind of person who will know what to do in the Texas Legislature, who will be able to withstand the pressure of the lobbyists in Austin," said the Mission mayor. "Sergio is known for his good family values that we hold so close, especially in the Mexican American community. He will be able to take care of our needs." Muñoz, Jr. is seeking the March 2, 2010 Democratic Party primary nomination. 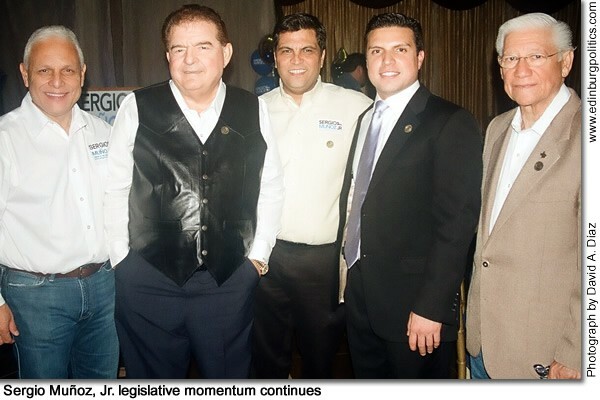 From left are: former Rep. Sergio Muñoz, Sr.; Mission Mayor Norberto Salinas; Julio Cerda, Mission city manager; Sergio Muñoz, Jr.; and former Rep. Roberto Gutiérrez, D-McAllen. See lead story in this posting. 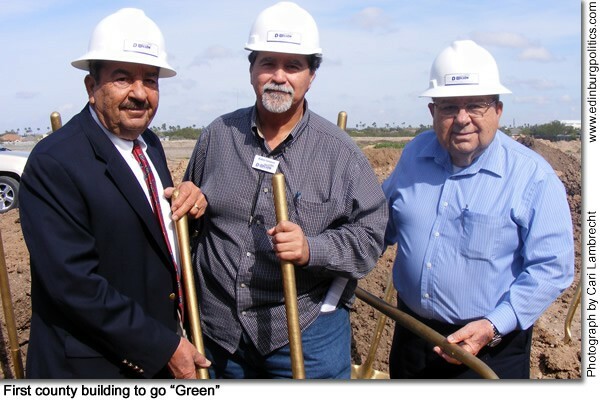 Hidalgo County Precinct 2 Commissioner Héctor “Tito” Palacios, featured left, on Tuesday, December 22, unveiled plans and broke ground in San Juan for what will become the county’s first "green"-minded building, which promotes the protection of the environment. “Precinct 2 is committed to providing high-quality services to our residents, and having this building along with our other two community resource centers near where people live and work helps us to bring county government to the people. We are also working with the youth in our communities to educate them, get them ready for post-secondary education and the workforce. Having the energy of PSJA ISD next door will be good for everybody. I feel strongly that this is not just another building, but a commitment to learning and growing smartly,” said Commissioner Palacios. Wind turbines, solar panels, LED solar lighting, insulated concrete form exterior wall construction and several other exterior and interior green building components will respect not only the environment, but also taxpayer funds, because green buildings are shown to save on energy costs in the long term. 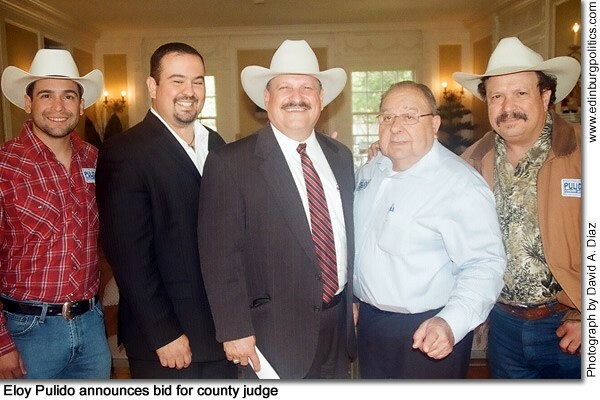 Featured, from left: Commissioner Palacios; Rubén Cavazos, project manager for D. Wilson Construction Co.; and Pharr Mayor Leopoldo “Polo” Palacios. See story later in this posting. 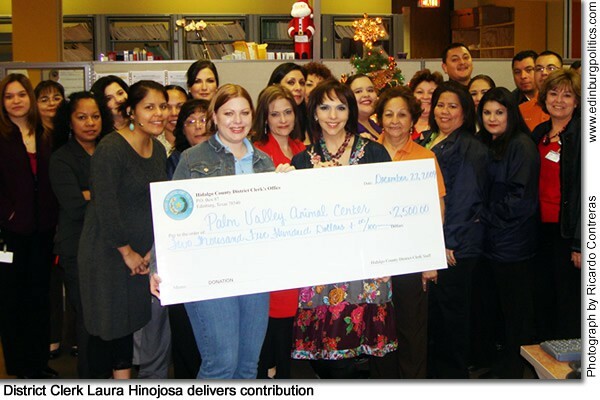 The Hidalgo County District Clerk staff, led by District Clerk Laura Hinojosa, featured front row to the right, helping hold up check, on Tuesday, December 22, presented a contribution of $2,500 to the Palm Valley Animal Center as part of their Blues for Bucks Workplace Fundraising Campaign to benefit local charitable organizations. The Palm Valley Animal Center is a private, non-profit, open-door animal welfare agency serving the needs of animals, pet owners and the community at large and is the only animal shelter serving Hidalgo County. “Our staff is pleased to be able to give back to the community through our workplace fundraising campaign. Although our staff contributions are small, we recognize their significant affect on many of the nonprofit organizations that rely solely on the local support of their community,” said Hinojosa. See story later in this posting. Sergio Muñoz, Jr.’s state representative campaign on Monday, December 21, drew big names and generous contributions from House District 36 during a fundraiser held that evening at Balli’s Social & Event Center in Mission. Almost 150 supporters, including Mission Mayor Norberto Salinas, Pharr Mayor Mayor Leo "Polo" Palacios, and Hidalgo City Commissioner Guillermo Ramírez joined Muñoz, a Democratic candidate for state representative, and his family during the rally. Muñoz, a successful attorney and Palmview Municipal Court Judge, is seeking the Democratic Party nomination on March 2, 2010. The gathering generated about $100,000 in campaign contributions and pledges, which will be invested right back into the local district to help cover expenses ranging from purchasing fuel and food for volunteers, buying other essential supplies and services from local businesses, and helping Muñoz travel the region in the coming months to meet with thousands of voters. Given that the event came as most people’s attention was focused on Christmas and not politics, Muñoz said he was surprised and appreciative that the turnout was about three times the initial expectations. "I am very humbled by this wonderful showing, but there is tremendous interest by South Texans to send a strong advocate to the Texas Legislature," he said. "My campaign is not about me, it is about all of the people of House District 36." He noted that as he has "campaigned throughout this great area, I’m the one who has been inspired by the wonderful people, from all walks of life, who live in this district, who have great ideas, who will help me keep House District 36 the tremendous success story which it has become." Muñoz emphasized his legislative platform, which he said focused on creating more jobs, sparking economic development, helping make health care more accessible and affordable, improving educational resources in public schools and in higher education, and helping improve public safety, including cracking down on sexual predators. "I’m running because I believe my years of professional and community services, my experiences as a defender of the people, combined with my vision and commitment for all of us to have a better life are positive qualifications to serve the good people of District 36," he continued. The Mission mayor said Muñoz has education, loyalty, and high moral character to overcome the power of special interest groups which do not care about the legislative needs or personal convictions of the overwhelming majority of South Texans. "Sergio will be the kind of person who will know what to do in the Texas Legislature, who will be able to withstand the pressure of the lobbyists in Austin," said Salinas. "Sergio is known for his good family values that we hold so close, especially in the Mexican American community. He will be able to take care of our needs." Palacios, the Pharr mayor, said Muñoz’ strong support for securing increased funding for education and landing new funding for a sought-after Veterans Affairs Hospital in the Valley will result in tremendous economic development and a higher quality of life for the entire area. "Being a veteran myself (Korean Conflict), I am very, very glad to see that Sergio has made a VA Hospital one of the major issues he will be working on in Austin," said Palacios. "He will also work hard to continue to get funding for education, including money for UT-Pan American and South Texas College. Education is the key to success for all of us." Muñoz earned a business degree from the University of Texas at Austin and then graduated from Thurgood Marshal School of Law in Houston. Ramírez, the Hidalgo city commissioner, said Muñoz has the credentials, vision, and energy to succeed in the Texas House of Representatives. "Sergio brings that right combination of passion, dedication, and knowledge about the issues, and that is what we need in the Texas Legislature," said Ramírez. "There is no doubt that once Sergio begins his work in Austin, he will be a champion for education, health care, and the other major needs we have in Hidalgo County." Edinburg posted a 6.8 percent unemployment rate in November 2009, reflecting a small drop from the previous month, but still the best showing among all major Valley communities, according to the latest figures released by the Texas Workforce Commission. By comparison, in October, Edinburg reported a seven percent unemployment rate, preceded by 7.6 percent rate in September, and a 7.7 percent level in August. Those four monthly showings represent slow, but ongoing, improvements since July 2009, when the city’s rate hit 7.8 percent — the worst showing in more than four and a half years. The November 2009 rate was released on Friday, December 18 by the Texas Workforce Commission. The unemployment rates among the Valley’s major cities represented a mixed bag of results. For November 2009, Texas’ seasonally adjusted unemployment rate declined to eight percent, down from 8.3 percent a month ago, and continued to trend well below the U.S. seasonally adjusted unemployment rate for November at 10 percent. Five cities – Edinburg, McAllen, Harlingen, Pharr, and Mission – saw small drops in their unemployment rates in November compared with October. San Benito and Weslaco maintained the same unemployment rates in November and October. Brownsville and San Juan saw small increases in their unemployment rate in November from October. McAllen – the economic leader in the Valley – registered a 7.1 percent unemployment rate in November, an improvement over its 7.4 percent rate in October, 7.5 percent in September, and 7.3 percent in August. October, 11 percent in September, and 10.7 percent in August. At a county-wide level, the employment picture was still above double-digit rates. All cities in Hidalgo County combined averaged an 11.2 percent unemployment rate – the same level as during October – but better than 11.6 percent in September, 11.4 percent in August and 11.5 percent in July. All cities in Cameron County combined averaged a 10.5 percent unemployment rate – the same level as during October – but better than the 10.8 percent rate in September, the same as the 10.5 percent rate in August, and better than the 10.6 percent rate in July. The latest figures for Edinburg and all other cities only go back to 2005, according to the Texas Workforce Commission, because of substantial methodology changes between 2004 and 2005 in estimating city unemployment statistics, Texas city data is not available prior to 2005. A reported 2,187 Edinburg residents who were willing and able to work in November 2009 had no luck finding a job, according to the state agency. The year before, in November 2008, the city’s unemployment rate stood at 5.2 percent, when there were 1,602 residents jobless but looking for work, according to the Edinburg Economic Development Corporation, which is the jobs-creation arm of the Edinburg City Council. In November 2005, the unemployment rate in Edinburg was 4.4 percent. The higher figures come two years after Edinburg has its best showing in the city’s history. In November 2007, only 3.7 percent of Edinburg’s civilian labor force was unable to find work. To be considered unemployed, a person has to be not working but willing and able to work and actively seeking work. San Juan – 11.4 percent (11.1 percent in October, 11.8 percent in September, 12 percent in August, 11.9 percent in July). The Texas Civilian Labor Force reached its highest level ever at 12.1 million workers in November. Total nonagricultural employment in Texas increased by 17,300 positions in November for a total of almost 70,000 jobs over the past two months, while the nation as a whole lost 122,000 jobs. During November, Mining and Logging employment increased by 5,100 jobs, Financial Activities employment rose by 4,700 jobs, and Professional and Business Services added 3,300 positions. Leisure and Hospitality employment increased by 4,800 positions in November. Education and Health Services employment grew by 4,600 jobs in November, marking 14 consecutive monthly employment gains in that industry. Since November 2008, employment in Education and Health Services increased by 60,000 jobs, a 4.6 percent gain. The Amarillo Metropolitan Statistical Area (MSA) experienced the lowest unemployment rate in the state at 5.3 percent (not seasonally adjusted), followed by the Lubbock MSA with 5.4 percent, and the Midland MSA with 5.6 percent. A Houston man who recruited others to steal and transport millions of dollars of truck tractors, trailers and other heavy equipment to Central America has been sentenced to prison, United States Attorney Tim Johnson announced on Wednesday, December 23. United States District Judge David Hittner sentenced Yuri David Meléndez, 43, to a total of nine years in federal prison for his leadership role in the truck theft scheme and in an unrelated narcotics charge during a hearing today. Meléndez, who was convicted of conspiracy to export and transport stolen motor vehicles after pleading guilty, was sentenced to five years imprisonment, the maximum punishment under the law. Meléndez was also sentenced on December 23 to 108 months in federal prison on an unrelated narcotics trafficking charge filed in federal court in Florida. The Florida case was transferred to this district after Meléndez was apprehended in this district and agreed to plead guilty to the narcotics trafficking charge pending in Florida. Hittner ordered that the terms of imprisonment imposed on each count of conviction be served concurrently. Meléndez was ordered to pay $815,951.91 in restitution and to serve a five-year term of supervision upon his release from federal prison. Beginning in 2001, Meléndez received requests from his contacts in Central America for stolen tractor trucks, trailers, tankers, and other heavy equipment. Meléndez would then locate the requested equipment at various industrial and commercial sites in the Houston area and recruit co-conspirators to assist with the theft of the equipment. Once stolen, the equipment was transported south by Meléndez’ recruits to staging locations near Edinburg. Meléndez frequently accompanied the drivers in his own private vehicle on the way to Edinburg, serving as a guide and look-out for law enforcement. Once in Edinburg, other unidentified members of the conspiracy would arrange for transportation of the equipment across the border into Mexico. Drivers took the equipment to Meléndez’ customers—most of whom resided in Guatemala and Honduras. Following delivery, Meléndez’ contacts would pay him by wire transfer or cash delivery in Houston. Melendez managed to evade law enforcement for a number of years until early February 2009 when two of his recruits were arrested in possession of recently stolen tanker trucks. In mid-January 2009, after receiving an order for two tanker trucks, Meléndez sent Víctor Antonio García, 27, who had stolen equipment for Meléndez in the past, to Reynosa, to recruit Orlando González Huerta, 29, as a second driver for the job. Meléndez then arranged for Garcia and Huerta to fly to Houston. The men stayed at a local motel while Meléndez located two tanker trucks to be stolen. On the evening of February 8, 2009, Meléndez drove García and Huerta to the Colorado Oil Company in Sealy, Texas, where the two broke through a chain link fence with bolt cutters. Garcia and Huerta each drove a tanker truck out of the company’s compound south towards Edinburg and Meléndez followed the pair in his private vehicle. Employees of the Colorado Oil Company reported the equipment missing. Using GPS tracking devices attached to the tanker trucks, officers with the Texas Department of Public Safety located and arrested García and Huerta in Live Oak County, Texas. Huerta identified Meléndez in a photographic line-up and within days FBI agents located and arrested Meléndez at his home in Houston. Investigating agents definitively linked Meléndez and his conspirators to other thefts by viewing surveillance photographs taken at the Falfurrias checkpoint located north of Edinburg. Since March 2007, the photographs revealed more than 20 pieces of stolen equipment passing through the checkpoint, typically during early morning hours. In each case, the stolen piece of equipment was accompanied by a vehicle associated with Meléndez. Since March 2007, Meléndez and his co-conspirators were found to have transported more than $4 million of stolen equipment through the Falfurrias Border Patrol checkpoint. García, Huerta, and a third co-defendant, Rito-Jasso-Zorilla, 32, all of whom also pleaded guilty to conspiring to export and transport stolen motor vehicles and equipment, were previously sentenced to terms of imprisonment of between 24 and 51 months. In the Florida case, Meléndez admitted to attempting to purchase two kilograms of cocaine. The United States seized and has forfeited Meléndez’ interest in $33,000 in cash. The investigation leading to the truck theft charges was conducted by the FBI and the Texas Department of Public Safety. The narcotics charges were investigated by the Drug Enforcement Administration. Assistant United States Attorney David Searle prosecuted the cases. Previously, due to a limited supply, only high-risk populations such as pregnant women, children, those with chronic health conditions and health care givers were able to receive the vaccine; however, Hidalgo County Health and Human Services is now offering vaccinations to anyone from the age 6 month old to 65 years of age. A vaccine is a preventative measure. If a resident is already exhibiting influenza-like symptoms, he or she should see a doctor for treatment. All seven Hidalgo County health department clinics are offering the vaccine during normal business hours — 8 a.m. to 5 p.m. The vaccine is FREE, and parents are encouraged to bring in their children’s immunization cards. In addition, residents should stay tuned in to their local media for news about specialty clinics. Private providers also have access to the H1N1 vaccine if residents prefer to visit their family doctor. Congressman Rubén Hinojosa, D-Mercedes, on Friday, December 18, announced the Edinburg and Pharr will be receiving the Energy Efficiency and Conservation Block Grant (EECBG) awards will go to the cities of Pharr and Edinburg. These are first time grants funded by the American Recovery and Reinvestment Act. The funds are awarded to help communities improve their energy efficiency, reduce their energy use and fossil fuel emissions, and create green jobs locally. “We are looking at new ways to save and create energy and at the same time create local green jobs in the Rio Grande Valley,” said Hinojosa. “These grants will give the communities of Pharr and Edinburg an opportunity to build on new and innovative ideas on saving energy in their homes and in their businesses”. Edinburg will receive $683,100 while Pharr will receive $608,900, totaling $1,292,000, through the U.S. Department of Energy. These funds come from a EECBG program that totals $3.2 billion, of which $2.7 billion will be awarded through formula grants to more that 2,300 cities, counties, states, and Indian tribes nationwide. In addition, more than $400 million will be delivered through competitive grants. “I was notified of these grants for the Rio Grande Valley through the White House Office of Legislative Affairs”, said Hinojosa. “This funding was created through the American Recovery and Reinvestment Act, which I voted for because I believe we must always invest in our local communities”. Activities eligible for EECBG funding include energy audits and building retrofits in the residential and commercial sector, the development and implementation of advanced building codes and inspections, and the creation of financial incentive programs for energy efficiency improvements. Throughout the programs implementation, DOE will provide strong oversight a the local, state, and tribal level, while emphasizing the need to quickly award funds to help create new jobs and stimulate local economies. Hidalgo County Pct. 2 Commissioner Héctor “Tito” Palacios unveiled plans and broke ground on Tuesday, December 22, for what will become the county’s first "green"-minded building. Wind turbines, solar panels, LED solar lighting, insulated concrete form exterior wall construction and several other exterior and interior green building components will respect not only the environment, but also taxpayer funds, because green buildings are shown to save on energy costs in the long term. Palacios envisions that the new $5.075 million multi-purpose complex — which will house Precinct 2 administrative offices as well as the Health and Human Services Pharr clinic, a W.I.C. office, a substation for the tax assessor-collector and offices for Justices of the Peace Places 1 and 2 — will bring critical services closer to the people and fuel residents’ and students’ curiosity about environmental sciences and spike their interests in new innovative ways of thinking in government. The complex is located on South Highway 281 and Hall Acres Road adjacent to a Pharr-San Juan-Alamo ISD middle school that is also currently under construction. The school district and the precinct are in talks about collaborating on the future development of a 4-acre park to be located next to the county offices. The park, along with a detention pond and a rain water collection system, could provide an outdoor classroom setting for students like none other and compliment the other environmentally-friendly aspects of the project. “Precinct 2 is committed to providing high-quality services to our residents, and having this building along with our other two community resource centers near where people live and work helps us to bring county government to the people. We are also working with the youth in our communities to educate them, get them ready for post-secondary education and the workforce. Having the energy of PSJA ISD next door will be good for everybody. I feel strongly that this is not just another building, but a commitment to learning and growing smartly,” said Palacios. V.A. Architecture designed the Pct. 2 multi-purpose complex and all four buildings will be erected in a timeline of approximately 10 months by Wilson Construction. Grants from the State Energy Conservation Office and U.S. Department of Energy, combined with county Capital Improvement Project bonds, are financing the project. Additional green grant funding and partnerships are being sought to round out the complex’s future planned projects. Congressman Rubén Hinojosa, D-Mercedes, on Friday, December 18, announced that the U.S. Department of Education has awarded the Valley Association For Independent Living in McAllen a grant for $200,031. The grant comes from the Center for Independence Living Recovery Act, which is part of the American Recovery and Reinvestment Act of 2009. The Valley Association For Independent Living, also known as VAIL, provides an array of services for persons with disabilities including, services for the deaf, sign language classes, interpreting services, independent living services and Social Security benefits counseling. “This center is vital to people with disabilities who are trying to live independently,” said Hinojosa. “This is another good example of how the American Recovery and Reinvestment Act of 2009 is good for our local economy and for our residents in need." Grantees under the Center for Independent Living Program may use the funding to improve and expand the types of independent living services provided; serve additional consumers, especially populations that are unserved or underserved; increase their capacity to provide Independent Living services; and maximize employment opportunities and economic benefits to individuals with significant disabilities consistent with the goals and objectives established by individual consumers. The grant will be used over a five year period. It could be used to train current staff on specific programs, to improving or purchasing technological equipment for the center. VAIL is located at 3012 N. McColl Road in McAllen. A new online program that will allow former college students who didn’t graduate a chance to complete their bachelor’s degrees in a fast-track format from three University of Texas System institutions will launch in fall 2010. The Bachelor’s Accelerated Completion (BAC) program will be offered entirely online from UT Arlington, UT-El Paso and UT-Permian Basin. Administered through the UT TeleCampus, the program will target adult students who completed roughly 60 semester credit hours or more and provide an accelerated pathway to obtaining baccalaureate degrees that include concentrations in up to three disciplines. Courses will be six to seven weeks long. Students from anywhere in Texas – or elsewhere across the country – will be eligible to apply for admission to the program. Prospective students to the BAC program still will have to meet the institution’s admissions requirements before they can be admitted into the program, and students also can qualify for financial aid. Costs before financial aid will be $600 per three-hour-credit course, which means students could complete a semester’s worth of courses for as little as $2,400 in 12 weeks. Faculty from the UT campuses at Arlington, El Paso and in the Permian Basin will teach the online courses through the UT TeleCampus. Initially, degree plans offered will be in humanities, university studies and multidisciplinary studies, but other degree plans will be added over time. While the program will target prospective students with significant undergraduate credits, students who have relatively fewer credits may take required courses online or in traditional classrooms at universities or community colleges. UT TeleCampus staff will assist those students with planning and locating such courses. The UT TeleCampus has established a user-friendly Web site to help prospective students select a degree plan. The site, http://www.bac2ut.org, also includes information about admissions, financial aid and academic advising. “We believe this program offers extraordinary flexibility and affordability to adults, many of whom are working or are stay-at-home parents and likely would not have the time and resources to complete their bachelor’s degrees by attending face-to-face classes on a campus,” said Darcy Hardy, assistant vice chancellor of academic affairs for the UT System and executive director of the UT TeleCampus. The Lumina Foundation earlier this month awarded the UT TeleCampus a $500,000 grant to help launch the program, which is expected to be self-sustaining within three years, Hardy said. Founded in 1998, the UT TeleCampus mission is to extend the reach of the University of Texas System through quality online education. UTTC operates at the System administration level and partners with UT institutions to deliver online courses and degrees while also providing year-round support in the critical areas of student and faculty services, course development, technology and marketing. Since launching, the UT TeleCampus has served more than 86,000 student enrollments in more than 30 online degree and certificate programs. Serving the educational and health care needs of Texans for more than 125 years, The University of Texas System is one of the nation’s largest higher education systems, with nine academic campuses and six health institutions. The UT System has an annual operating budget of $11.9 billion (FY 2010) including $2.5 billion in sponsored programs funded by federal, state, local and private sources. Preliminary student enrollment exceeded 202,000 in the 2009 academic year. The UT System confers more than one-third of the state’s undergraduate degrees and educates nearly three-fourths of the state’s health care professionals annually. With more than 84,000 employees, the UT System is one of the largest employers in the state. Speaker of the House Joe Straus, R-San Antonio, on Wednesday, December 23, announced reappointments to the Legislative Budget Board. Rep. Dan Branch, R-Dallas, and Rep. Sylvester Turner, D-Houston, have been reappointed to continue their important work. Rep. René Oliveira, Chairman of Ways and Means, D-Brownsville, and Rep. Jim Pitts, Chairman of Appropriations, R-Waxahachie, will serve on the board ex officio in their capacity as committee chairmen. In general, ex officio, which Latin for "from the office," describes someone who has a right because of an office held, such as being allowed to sit on a committee simply because one is president of the corporation, or in the case of Oliveira and Pitts, because they serve as chairman of House committees. The Legislative Budget Board (LBB) is a permanent joint committee of the Texas Legislature that develops budget and policy recommendations for legislative appropriations for all agencies of state government, as well as completes fiscal analyses for proposed legislation. The LBB also conducts evaluations and reviews for the purpose of identifying and recommending changes that improve the efficiency and performance of state and local operations and finances. Legislation creating the LBB requires all state agencies to submit their budget requests to The Board for review and recommendations. The Hidalgo County Republican Women hosted its annual officer installation ceremony on (enter day), December 12 at The Club at Cimarron. Officers were installed by Javier Villalobos, a Republican activist and area attorney. Villalobos conducted the swearing-in ceremony to the newly elected slate for 2010. Hilda Solis is president; Janice McConaha-Komer is vice-president; Brenda Houston is secretary; and Carol Crosby is secretary. Following the installation of officers, Villalobos spoke about the importance of political commitment to conservative issues and the benefits of activism. He is a graduate of Texas State University with a bachelor’s degree in business and accounting. He worked as an auditor for the Texas Railroad Commission before going to law school. After graduating from Thurgood Marshall School of Law, he opened up an office in McAllen in partnership with Jeff Vaughan. The firm now has offices in McAllen and Houston, where they specialize in commercial litigation and economic development, as well as general civil matters. The Hidalgo County Republican Women is open to all women interested in conservative and charitable causes. Activities include collections for Women Together/Mujeres Unidas, the Rainbow Room of Child Protective Services, literacy projects and a wide array of speakers on issues of public interest. During December, the club sent Christmas cards to soldiers serving their country in foreign lands. More that 1,000 hand-written cards have been sent to U.S. soldiers in recent years. Men are also invited to join as associate members and they often attend meetings. In October the club donated school supplies and backpacks to their adopted school, Lucille Hendricks Elementary in McAllen. Hendricks was a longtime officer and member of the Republican Women’s Club as well as a conservative activist. Persons wishing to attend club meetings or to join the organization may contact Carol Crosy, HCRW treasurer, at 787-1361 for more information. South Texas Health System officials recently announced the appointment of Mike Adams, formerly with Edinburg Regional Medical Center and Edinburg Children’s Hospital, to the position of chief operating officer (COO) at McAllen Heart Hospital, the first heart hospital built in the nation. In general, the chief operating officer is the senior manager who is responsible for managing the company’s day-to-day operations and reporting them to the chief executive officer (CEO). Most recently, Adams served as interim chief operating officer at McAllen Heart Hospital. Prior to that, he managed acute care operations and administrative activities as the chief operating officer at Edinburg Regional Medical Center and Edinburg Children’s Hospital. Adams has 14 years of experience in healthcare management and is an active member in the American College of Healthcare Executives. He earned a Bachelor’s degree in Behavioral Science from Western Illinois University and has over 30 years of progressive management experience. He and his wife currently reside in Mission. McAllen Heart Hospital has a long history of providing high quality, patient-centered care for residents in the Rio Grande Valley. Since it opened as the first specialty hospital built in the nation, the facility has earned a number of accolades. It is rated number one in Texas for overall cardiac care and cardiac surgery by Healthgrades, received recognition by the Centers for Medicare and Medicaid Services for its treatment of congestive heart failure and is the only accredited chest pain center with PCI in the Rio Grande Valley. McAllen Heart Hospital is a South Texas Health System facility owned and operated by a subsidiary of Universal Health Services, Inc. (UHS), a King of Prussia, PA-based company that is one of the largest healthcare management companies in the nation. South Texas Health System is recognized for its reputation of excellence in providing quality healthcare in the Rio Grande Valley. As the Valley’s leading hospital system, it offers specialized services in behavioral health, cardiovascular care, emergency medicine, neuroscience, oncology, pediatric care, women’s services, and rehabilitation. South Texas Health System facilities include: Edinburg Children’s Hospital, Edinburg Regional Medical Center, Edinburg Regional Rehab Center, McAllen Medical Center, McAllen Heart Hospital and South Texas Behavioral Health Center and Cornerstone Regional Hospital. For more information visit http://www.southtexashealthsystem.com . The Hidalgo County District Clerk staff, led by District Clerk Laura Hinojosa, on Tuesday, December 22, presented a check totaling $2,500 to the Palm Valley Animal Center as part of their Blues for Bucks Workplace Fundraising Campaign to benefit local charitable organizations. The Palm Valley Animal Center is a private, non-profit, open-door animal welfare agency serving the needs of animals, pet owners and the community at large and is the only animal shelter serving Hidalgo County. “Our staff is pleased to be able to give back to the community through our workplace fundraising campaign. Although our staff contributions are small, we recognize their significant affect on many of the nonprofit organizations that rely solely on the local support of their community,” said Hinojosa. The district clerk office kicked off their charitable efforts in 2008 as part of the American Heart Association’s Go Red for Womencampaign. The program, which allows department staff to wear jeans every Friday in exchange for a $5 donation, has since then expanded their efforts through the creation of a “charitable organizations list” of which staff randomly selects a recipient every six months. Over the past two years the district clerk office has collected more than $10,500, which has gone to the American Heart Association, the American Diabetes Association and the Make-A-Wish Foundation. For more information on volunteer opportunities or making a contribution to the Palm Valley Animal Center, log on to http://palmvalleyanimalcenter.org/ or contact Shannon Ponce at (956) 686-1141 ext. 26, or development@palmvalleyanimalcenter.org. The Federal Communications Commission on Tuesday, December 17, announced the dates, times, and locations of the January public workshops for the FCC’s open Internet proceeding. These workshops will explore the impact of the Internet’s openness on consumers, innovation, and investment. The next public workshop will occur on Wednesday, January 13, 2010 at 5 p.m. at the MIT Media Lab in Cambridge, Mass. and will address innovation, investment, and the open Internet. It will be followed by a workshop on consumers, transparency, and the open Internet on Tuesday, January 19, 2010 starting at 1 p.m. in the Commission meeting room. The dates, locations, and topics for additional spring workshops for the open Internet proceeding will be announced in early 2010. Agendas for the January 13 and January 19 workshops will be made available in early January. All workshops will be open to the public; however, admittance will be limited to the seating available. Audio/video coverage of the workshops will be broadcast live with open captioning over the Web on HYPERLINK "http://www.openinternet.gov/" \o "http://www.openinternet.gov/" http://www.OpenInternet.gov. Reasonable accommodations for persons with disabilities are available upon request. Please include a description of the accommodation you will need. Individuals making such requests must include their contact information should FCC staff need to contact them for more information. Requests should be made as early as possible. Please send an e-mail to HYPERLINK "mailto:fcc504@fcc.gov" \o "mailto:fcc504@fcc.gov" fcc504@fcc.gov or call the Consumer & Governmental Affairs Bureau: 202-418-0530 (voice), 202-418-0432 (TTY). For additional information about the workshops, please visit: http://www.OpenInternet.gov. A former employee of a foot care clinic in Pharr/San Juan has pleaded guilty to health care fraud, United States Attorney Tim Johnson and Texas Attorney General Greg Abbott announced on Monday, December 21. Manuela K. Alana, 40, of Pharr, pleaded guilty to submitting false and fraudulent claims to both the Medicare and Medicaid health care programs for payment of services performed as an unlicensed podiatrist before United States District Judge Randy Crane. Alana was indicted in September 2009 along with the licensed podiatrist who owned and operated the Valley Medical Foot Care in Pharr/San Juan. Alana admitted that from April 29, 2006, through May 6, 2006, claims totaling approximately $17,069 were submitted to both Medicare and Medicaid for podiatric services that falsely claimed the licensed podiatrist had performed the service when, in actuality, Alana – an unlicensed and unsupervised podiatrist – performed the services. Overall, since August 2004, more than $536,000 was submitted in false and fraudulent claims to both Medicare and Medicaid for podiatric services performed by Alana. Alana faces a maximum punishment of up to 10 years in prison and a fine not to exceed $250,000 at sentencing which has been set for March 9, 2010, at 2 p.m. The court has permitted Alana to remain on bond pending sentencing. The investigation leading to the charges in this case was conducted by the Department of Health and Human Services – Office of Inspector General (HHS-OIG), the FBI and the Texas Attorney General’s Office. Assistant United States Attorney Carolyn Ferko is prosecuting the case. A new audit tool used by Texas Comptroller Susan Combs has led to the indictment and arrest on Tuesday, December 22, of a South Texas convenience store owner for tax fraud. Rogelio Ramírez, owner of two Pepe’s Drive In stores in McAllen, was arrested today after being indicted for four felony counts of failure to remit sales tax collected on alcohol and tobacco and two felony counts of falsifying records. Ramírez is alleged to have collected and not remitted $100,000 or more in sales tax in 2008, and between $20,000 and $100,000 in the first eight months of 2009. He is charged with collecting but failing to pay the state $100,000 or more in calendar years 2006 and 2007 as well. The indictment is the first in Texas based on an investigation using a fraud detection tool initiated by Combs and passed by the Legislature in 2007. The law requires distributors of alcohol and tobacco products to report sales to retail outlets monthly, giving the Comptroller’s auditors the ability to compare the distributors’ reports against taxable sales already reported by retailers. Distributor reporting under the law began in January 2008. So far, the comptroller has assessed nearly $90 million in sales tax that might have gone unreported without the fraud detection capability offered by the new law. For more information about the comptroller’s efforts to arrest and prosecute tax evaders and prevent tax fraud, visit the Criminal Investigations Division Web site at http://www.window.state.tx.us/about/cid/. In response to Freedom of Information Act requests, the Federal Bureau of Investigation on Tuesday, December 22, released its investigative files on the late entertainer Michael Jackson, who died earlier this year. In 2003, Jackson was charged by the state of California with molestation and other counts. The final three files—62D-LA-236081, 252B-IR-6808, and 305B-LA-239205—detail the Bureau’s support to local law enforcement during the ensuing investigation. The first of these files describes an FBI response to a Los Angeles Police Department request to analyze computers and digital media obtained from Jackson’s home under court warrant. The second involves a request by the Santa Barbara County District Attorney for help and guidance from behavioral analysts in the FBI’s Critical Incident Response Group. In the last of the three files, an FBI agent from Los Angeles traveled to New York to interview a potential witness. The agent found this individual unwilling to cooperate and closed the matter. The case went to court in 2005, and Jackson was acquitted of all charges.